Everyone likes their pizza delivered fast, right?! On a recent project, we were tasked with providing a conveyor solutions for handling pizza at high speeds. 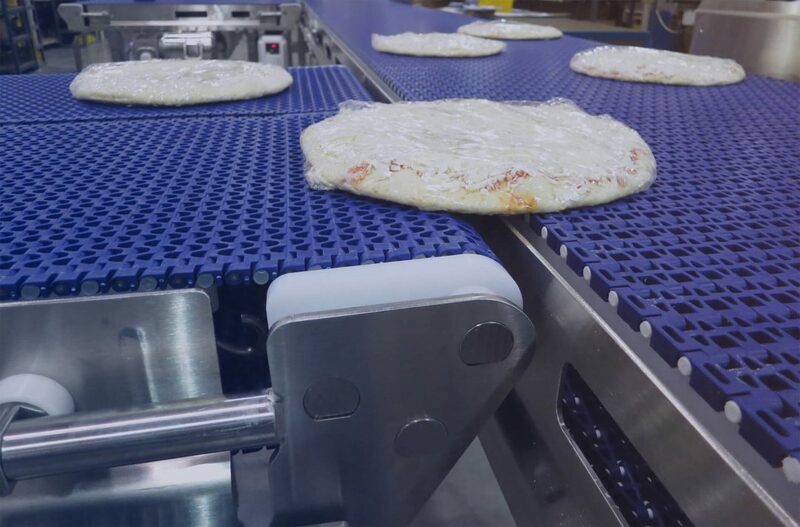 The pizzas were coming from a wrapping machine in several lanes on stainless steel AquaPruf 7400 Series conveyors and being transferred to a mainline 7400 Series conveyor traveling at speeds of up to 300 feet per minute. Once the pizzas made the transfer to the mainline conveyor, they were brought to a cartoner to be packaged. AquaPruf 7400 Series conveyors are designed for complete washdown and sanitation.